Mindrolling Jetsün Khandro Rinpoche aka Tsering Paldrön (Tib. ཚེ་རིང་དཔལ་སྒྲོན་, Wyl. tshe ring dpal sgron) (b.1967) is the daughter of Kyabjé Minling Trichen Rinpoche and one of the most renowned Tibetan teachers currently teaching in the West. She was recognized at the age of two by His Holiness the 16th Karmapa as the reincarnation of the great dakini of Tsurphu, Khandro Ugyen Tsomo, one of the most renowned female masters of her time. The present Khandro Rinpoche holds the lineages of both the Nyingma and Kagyü traditions. 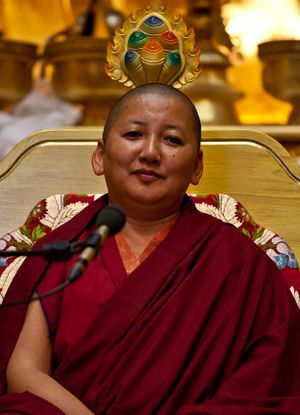 Khandro Rinpoche has received teachings and transmissions from some of the most accomplished masters of the 20th century, including His Holiness the Dalai Lama, Minling Trichen, Dilgo Khyentse Rinpoche, Trulshik Rinpoche, Tenga Rinpoche, Taklung Tsetrul Rinpoche and Tulku Urgyen Rinpoche. Rinpoche maintains a rigorous schedule, teaching from both the Kagyü and Nyingma traditions in the USA including Hawaii, Canada, Denmark, Norway, Spain, Germany, France, the Czech Republic and Greece. She has established and heads the Samten Tse Retreat Center in Mussoori, India, which is home to 30 nuns and also provides a place of study and retreat for monastics and western lay practitioners. Rinpoche is also resident teacher at the Lotus Garden Retreat Center in Virginia, USA, which she established to provide retreat practice, the study of important Buddhist texts, and visiting teachers from all lineages. Rinpoche is also actively involved with the Mindroling Monastery in Dehra Dun, India. She also heads a variety of charitable projects that supply health care and Buddhist education for monastics and lay practitioners who work side by side in a variety of challenging settings—including a leprosy project. Dzogchen Beara, Ireland, 15-17 June 2018, The Seven Points of Mind Training with an emphasis on point 3. Lerab Ling, France, 13-15 July 2018, The Seven Points of Mind Training. This page was last edited on 6 March 2019, at 09:06.